Vitamin supplements for kids are often made into gummy figures or chewy tablets. 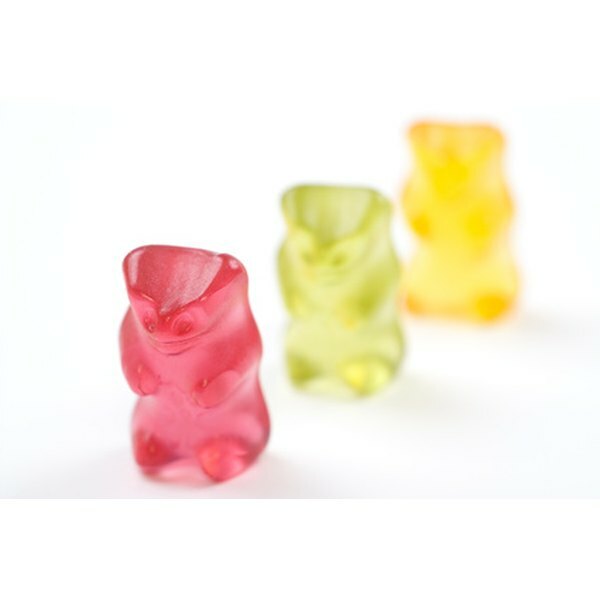 Quite often, companies will use gelatin, sometimes called gelatine, to create a soft, chewy consistency that makes vitamins easy for children to consume. According to the International Vegetarian Union, gelatin is made by boiling animal bones, skins or tendons and is unsuitable for a vegetarian diet. Vitamins formulated to meet both vegetarian and vegan dietary needs can be found in grocery stores and health-conscious specialty stores such as Whole Foods or The Vitamin Shoppe. As with any dietary changes, it is important to discuss taking supplements with your doctor or physician. Tall Tree Children’s Chewables are made by Country Life especially for children. The product is both a multivitamin and mineral complex, featuring a formula that is both vegetarian and kosher. Parents of vegetarian children with other food allergies may find that Tall Tree Children’s Chewable is a practical fit for dietary concerns. These vitamins do not contain wheat, milk or artificial flavorings, and are gluten-free. VegLife Vegan Kids Multiple by Nutraceutical is a one-hundred percent vegan multivitamin, and does not contain animal by-products. The vitamin comes in a kid-friendly berry flavor, but uses xylitol and sorbitol as sweeteners instead of fructose or artificial flavorings. Each tablet is chewable and suitable for children four years of age and up. The L’il Critters brand of vitamins presently has three vegetarian gummy options formulated for children: L'il Critters Multi-Vite Gummy Bears, Fruit & Veggie Bears and Calcium Gummy Bears with vitamin D. While these products mentioned are made without animal by-products, not all L’il Critters vitamins are exclusively vegetarian. Be sure to check the package and read through the ingredients list before purchasing. Gummy King manufactures multiple gummy vitamins for vegan kids, including Vitamin-C Gummi, Sugar Free Multivitamin Gummi, and Echinacea Plus Vitamin-C & Zinc Gummi. All of their gummy vitamins, except the DHA Omega-3 Gummi, are Certified Vegan by Vegan.org, and carry a cruelty-free trademark on their packaging. Asma Malik has provided professional writing services since 2007. Her articles have appeared in “Moving Pictures” magazine and on various specialty websites. Malik is also a third-degree black belt, certified instructor in the American Taekwondo Association. She earned both a bachelor's degree in computer information systems and a Certificate of International Business from the W.P. Carey School of Business at Arizona State University.